After the Syrian slapstick, it's time to sober up U.S. foreign policy. After writing in the London Telegraph that Monday was "the worst day for U.S. and wider Western diplomacy since records began," former British ambassador Charles Crawford asked simply: "How has this happened?" On the answer, opinions might differ. Or maybe not. A consensus assessment of the past week's events could easily form around Oliver Hardy's famous lament to the compulsive bumbler Stan Laurel: "Here's another nice mess you've gotten us into!" In the interplay between Barack Obama and John Kerry, it's not obvious which one is Laurel and which one is Hardy. But diplomatic slapstick is not funny. No one wants to live in a Laurel and Hardy presidency. 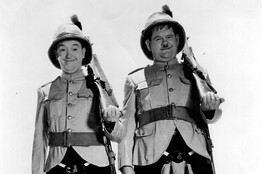 In a Laurel and Hardy presidency, red lines vanish, shots across the bow are word balloons, and a display of U.S. power with the whole world watching is going to be "unbelievably small." The past week was a perfect storm of American malfunction. Colliding at the center of a serious foreign-policy crisis was Barack Obama's manifest skills deficit, conservative animosity toward Mr. Obama, Republican distrust of his leadership, and the reflexive opportunism of politicians from Washington to Moscow. It is Barack Obama's impulse to make himself and whatever is in his head the center of attention. By now, we are used to it. But this week he turned himself, the presidency and the United States into a spectacle. We were alternately shocked and agog at these events. Now the sobering-up has to begin. The world has effectively lost its nominal leader, the U.S. president. Is this going to be the new normal? If so—and it will be so if serious people don't step up—we are looking at a weakened U.S president who has a very, very long three years left on his term. The belief by some that we can ride this out till a Reagan-like rescue comes in the 2016 election is wrong. Jimmy Carter's Iranian hostage crisis began on Nov. 4, 1979. One quick year later, the American people turned to Ronald Reagan. There will be no such chance next year or the year after that—not till November 2016. The libertarian lurch on foreign policy among some Republicans is a dead end. Libertarians understand markets. But left alone, the global market in aggression won't clear. Like a malign, untreated tumor, it will grow. You can't program it to kill only non-Americans. The world's worst impulses run by their own logic. What's going to stop them now? A congressional vote against that Syria resolution was never going to include a sequester for the Middle East. Iran's 16,600 uranium-enrichment centrifuges are spinning. Iran's overflights of Iraq to resupply Damascus with heavy arms and Quds forces will continue until Assad wins. Turkey and Saudi Arabia, U.S. allies, will start condominium talks with Iran, a U.S. enemy. Israel will do what it must, if it can. On Wednesday the Russian press reported that the Putin government has sold state-of-the-art S-300 anti-aircraft missiles and batteries to Iran, a system with the capability to create a no-fly zone along the Syrian-Lebanon border. It should be running like clockwork by 2016. Europe will consider a reset with the new status quo. There also isn't going to be a continuing resolution that defines limits for China the next 40 months. Articles now appear routinely describing how the U.S. "pivot" toward Asia is no longer believed by Asians. What if, after watching this week's Syrian spectacle, China next year lands a colony of fishermen on the Diaoyu Islands, known as the Senkakus to their Japanese claimants? China on Tuesday warned India about setting up new military posts along their disputed 4,000-kilometer border. Is North Korea's Kim Jong Un on hold till 2016? There isn't going to be a House vote to repeal al Qaeda, which can still threaten U.S. personnel or assets around the world. The White House, Congress and Beltway pundits are exhaling after the president of Russia took America off the hook of that frightful intervention vote by offering, in the middle of a war, to transfer Syria's chemical weapons inventory to the U.N.—a fairy tale if ever there was one. Ask any chemical-weapons disposal specialist. The president himself needs somehow to look beyond his own instinct on foreign policy. It's just not enough. The administration badly needs a formal strategic vision. Notwithstanding her piece of Benghazi, National Security Advisor Susan Rice, who gave a surprisingly tough speech Monday on the failure of the U.N. process and America's role now, may be the insider to start shaping a post-Syria strategy. Somebody has to do it. Conservative critics can carp for three years, which will dig the hole deeper, or contribute to a way forward. Allowing this week to become the status quo is unthinkable. A 40-month run of Laurel and Hardy's America will endanger everyone.